Cleric In U.K. Sentenced To 5 1/2 Years For Rallying Support For ISIS : The Two-Way Anjem Choudary was one of the U.K.'s most famous radical Islamic voices. But for years, police say, he carefully kept his public comments legally defensible. Then an oath in his name appeared online. Muslim cleric Anjem Choudary arrives at the Old Bailey in London for the start of his trial on Jan. 11. 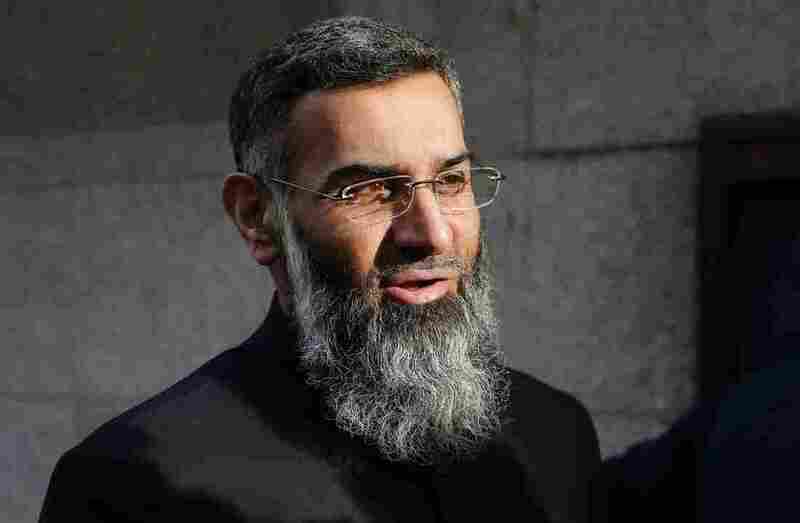 Choudary and Mohammed Rahman were convicted of inviting support for Islamic State. Anjem Choudary, one of the most famous radical Islamic preachers in the U.K., has been sentenced to 5 1/2 years in prison for urging people to support the Islamic State. According to scholars, the cleric radicalized at least 100 people who then turned to terrorism, NPR's Frank Langfitt reports. Among those he inspired was Michael Adebolajo, one of two militants who hacked a British soldier to death with knives and a cleaver on the streets of London in 2013. But despite being well-known to authorities, Choudary went free for years. "Police say he was hard to prosecute because he chose his public words carefully," Frank says. Choudary had been trained as a lawyer and was scrupulous about not violating British law. In fact, the BBC reports that counterterrorism officials spent some 20 years trying to find a way to prosecute Choudary for his radicalizing activities. "Publication online of Choudary's pledge to support ISIS finally gave authorities what they needed to convict," Frank says. Choudary was charged under the U.K.'s Terrorism Act and found guilty of encouraging support for the Islamic State. He showed no remorse, the judge in his case said, and had justified the "most appalling acts" of the Islamic State. But sentencing Choudary to prison time carries risks of its own, as Raffaello Pantucci, the director of International Security Studies at the Royal United Services Institute, told Frank last month. "He's a charismatic figure who is now going into prison where he will be surrounded by people who are, you know, vulnerable and who are at difficult points in their lives," Pantucci said. "And I think there's a huge question around what kind of damage he might be able to do within a prison context of radicalizing others." Another Islamic preacher, Mohammed Mizanur Rahman, was found guilty in the same trial and also sentenced to 5 1/2 years, The Associated Press reports.